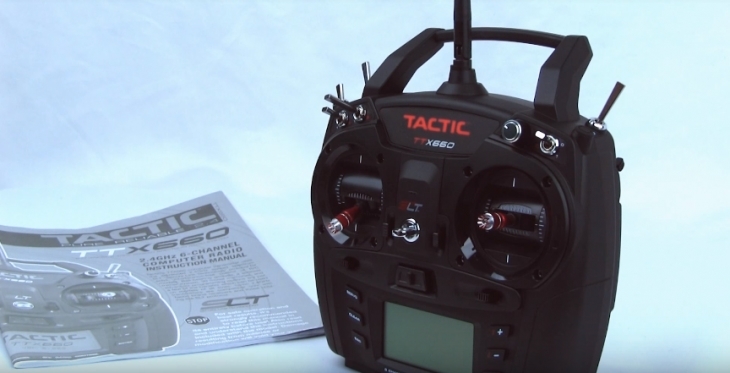 Best RC Transmitter For Planes Reviews: Top-5 in April 2019! This article will present you with five of the best radio control units for model plane flying. The review presents you with the key features of each model, and a basic overview of the products performance. I also provide you with a personal recommendation that is based on hands-on experience and customer reviews. So you want to be a drone pilot and need that extra precision to blow up your enemies? Or perhaps you just want to control a spy camera to steal trade secrets? Nope? You’re a 12-year-old with a great new RC plane and want a controller to save the world from an alien attack. It doesn’t really matter what you want to do with your RC plane, what you will need, apart from the plane, is an excellent RF transmitter that gives you absolute control over all aspects of your model’s flight functionality. Controlling a plane from flying it, in reality, is hard enough, but controlling it from a remote control is even harder. Sure, there is no danger from dying in a crash, but there is the danger of losing your model in a crash, and then there are performance levels for showing off as well as for competing. That is why I have tested and delivered the 5 best plan radio controllers on the market today. They all proved to be easy to understand, easy to use, and powerful enough to support all the requirements to provide a successful flight from take-off to landing. 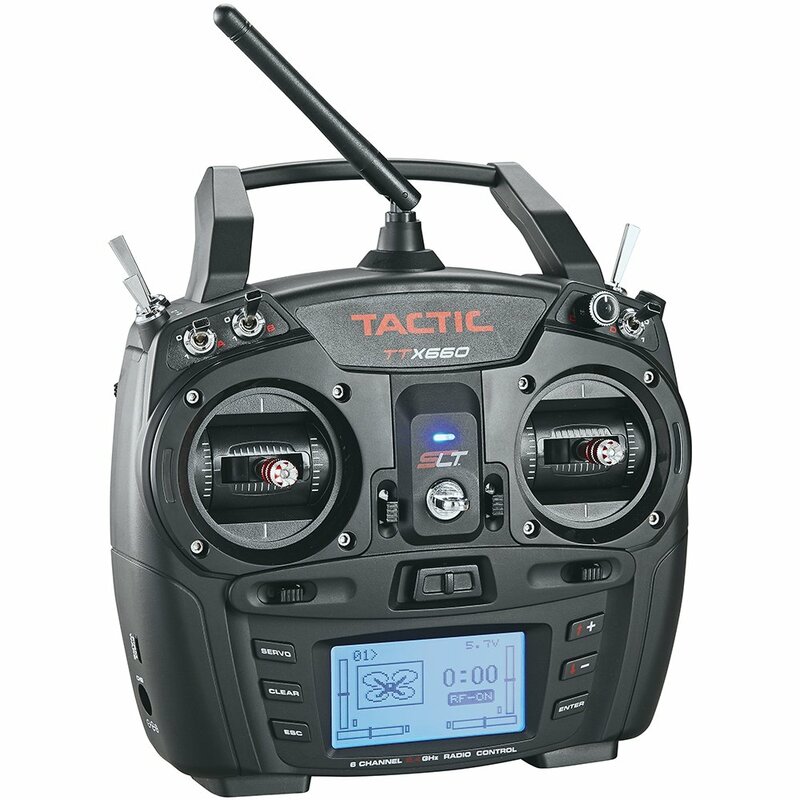 This is the 6 channel Tactic RC Radio Transmitter with LCD display and multiple control features. This is a performance model that comes with a low budget attraction price. It is a powerful and friendly unit and has a lot of features. This 6 channel model uses a modulation FHSS spread-spectrum SLT with a frequency range between 2.403-2.480GHz. It is a standard power model that uses 3.40-7.00V DC, which can come as 4 x 1.5V alkaline or 1.2V NiCd/NiMH “AA” single cells. You also get a jack to connect a charger for 4.8V NiCd or NiMH packs. This model comes with side located glide levers, and a 300° rotating dial (above the gimbal). You can assign functions and have a nicely sized LCD display to show you the current flight status. You also get a flight simulator cable jack. What you also get is a unit that is compatible with all SLT receivers and Tx-R aircraft, easy to use pushbutton programming and straightforward, intuitive menus with 30-model memory capacity. There are 4 programmable mixes and 8 pre-programmed mixes, and you control all reversing, sub-trim and travel limits on all the channels. This is a very nice lower budget-friendly unit that is versatile and easy to use. This is actually a great starter pack, since it won’t burn a hole in your pocket, and will provide you with all the intricacies of professional flight control. 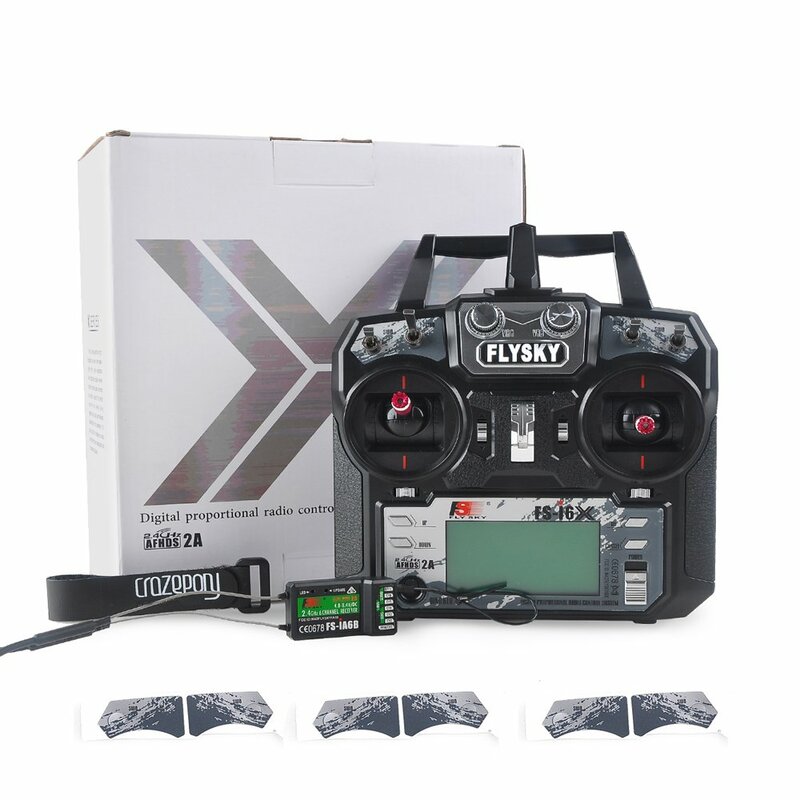 This is the Flysky FS-i6X 10CH 2.4GHz AFHDS 2A RC Transmitter With FS-iA10B Receiver that comes with their patented AFHDS 2A (Automatic Frequency Hopping Digital System Second Generation). What is AFHDS 2A (Automatic Frequency Hopping Digital System Second Generation)? Well, essentially, it’s a radio frequency protector that raises the integrity of the signal, reducing power consumption and maintaining the sensitivity of control. This model is bidirectional, and the transmitter receives back data, so you can view and adjust your flight using temperature, altitude, and other data. This model is a multi-channel Hopping Frequency that works in the 2.408GHz to 2.475GHz bandwidth range. You get 135 channels; the transmitter reduces interference by hopping between 16 channels. 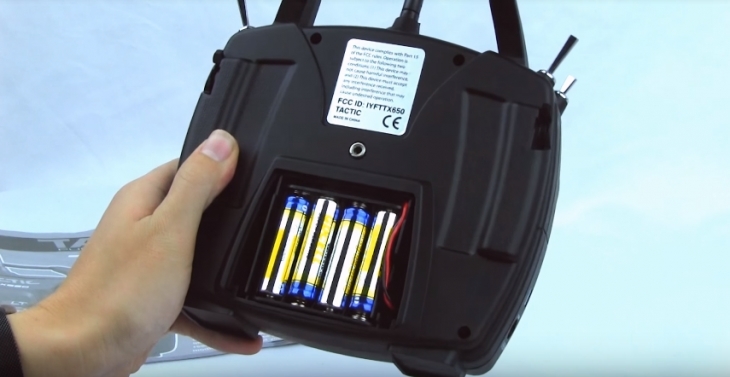 There is an Omni-directional high gain antenna that supports the channel hopping, and a Unique ID Recognition System for accurate pairing. This model is engineered for precision and high sensitivity, as such the components are all chosen for low energy consumption, which raises the battery life while maintaining constant performance. The FS-i6X RC Transmitter comes with a nice sized LCD display that provides you with all the feedback and data from your model in the air. This is another low budget set that delivers a great punch of accuracy. This is also a great starter pack and will deliver the necessary control precision for a beginner as well as an avid use. 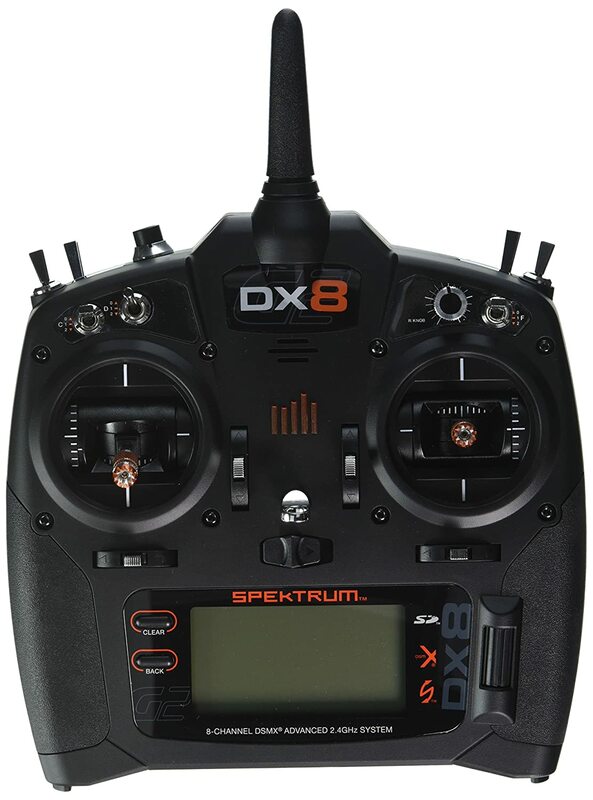 The Spektrum 2 DX8 Transmitter System MD2 with AR8000 Receiver is an 8-channel unit that comes with professional-level functionality. When it comes to professional use, for competing or for accuracy and long-distance range control, the DX8 G2 is the unit you want to have around. This unit is adaptable to all flight RC models, and it comes with voice alerts, a wireless trainer and 250 memory components. The antenna array provides you with both vertical and horizontal accumulation, which reduces blind spots. You also get to program voice alerts that will tell you when a specific issue is occurring, so you don’t need to look at the LCD display constantly. 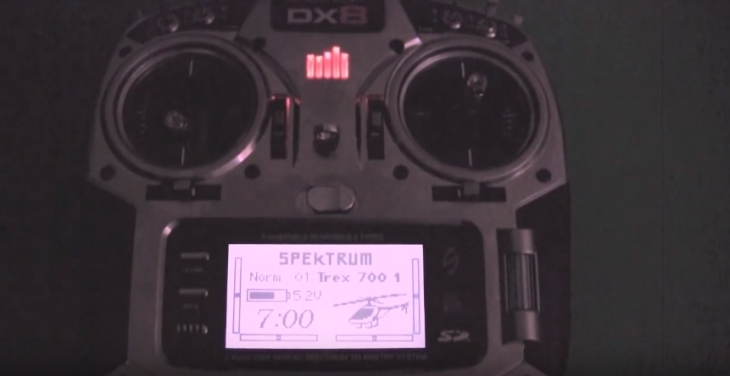 The Wireless Trainer Link allows you to connect your DX8 model with other Spektrum transmitters and specially-equipped Spektrum FPV headsets. The ModelMatch™ technology lets the DX8 re-link without re-going through the binding process. This lets you ”buddy box” with another DSM2®/DSMX® transmitter for teaching someone else to fly. It also lets you allocate gimbal functions to a 2nd ‘camera’ transmitter, and it links with specially-equipped Spektrum FPV headsets. The onboard memory card comes with 250 memory slots, so you don’t need to worry about SD toggling. You also get built-in telemetry feature that displays real-time information on just about all the flight aspects, including battery voltage, signal quality, airspeed, altitude, engine or motor temperature, and more. It’s hard to beat this model since the price is mid-range, it trounces the more expensive models that deliver similar feature and functionality. This is a semi-pro to pro unit and is a perfect controller for the enthusiast with more than one plane to fly. The Futuba 10JA Air T-FHSS Computer Radio Transmitter with R3008SB Receiver is a 10-channel model that sits at the top of the professional list and delivers exceptional performance. The R3008SB is a T-FHSS telemetry-capable receiver; it features S.Bus and S.Bus2 compatibility with 8 conventional ports. 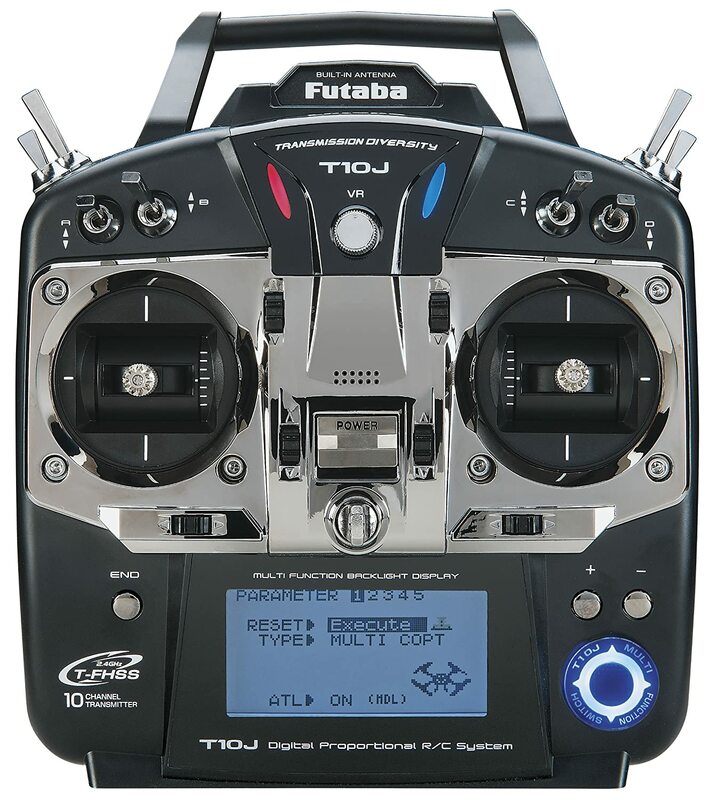 The Futuba 10JA Air T-FHSS is a high price professional model designed for the serious user, so if you fly drones on missions, this is the one you want to control your drone. The functionality includes telemetry capable, 10 channel, a fully programmable unit that comes with 30 memory functions and a classic LCD display screen. So, what do you get with the Futaba T-FHSS, S-FHSS 2.4GHz secured model? You get 30-model memory with an S.Bus capable T-FHSS receiver that transmits a wide array of Telemetry via a Synthesized voice that announces the telemetry data, so you can concentrate on controlling and not just scanning the display. This device comes with vibration alerts for alarm conditions and low battery conditions, and you also get wireless data transfer among other 10J transmitters. This is a user naming 10-character model with a large 128 x 64 dot backlit LCD display. This model also comes with a fast and easy programming jog dial with 3 buttons, and has full Sub-trim and fail-safe on all channels, with servo reversing, endpoint adjustment, digital trims, dual rates/exponential & ATL, as well as Trim step adjustability, Throttle cut and much more. There are many more features and functions than listed here, this model works with every flying thing out there, and if you are seeking a truly professional controller, then be ready to pay for one. This model is mid to high range but delivers where it counts. The Graupner MZ-24 Pro 12 Channel Remote Control Radio closes this list because it is a German feat of perfection. This is a 21 channel RC unit that is perhaps the one everyone aspires to beat. 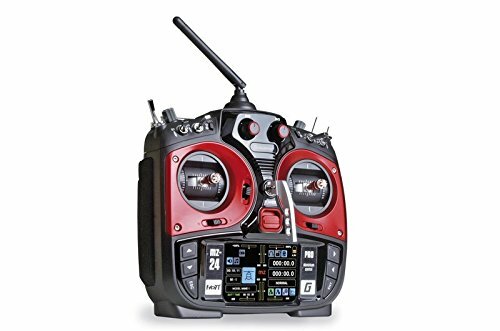 The Graupner MZ-24 Pro HoTT (Hopping Telemetry Transmission) uses an exceptionally well engineered 2.4GHz 12 Channel transmitter is designed with unique telemetry technology providing Bi-directional data transmission. This model reaches 75 frequency hopping channels that assure perfect and secure performance without interference. The model provides optional sensors and sensor modules, that see and analyze real-time data including RPM, voltage, current, temperature, and much more. The MZ-24 Pro has a 30-model memory capacity. The case is also a feat of engineering, no plastics here, this model provides you with aluminum quad bearing 4096 resolutions gimbals, a Full color, 3.5″ TFT Touch LCD screen, and a smart voice announcement system. You get SUMO, SUMD functions that provides constant and comfortable control of gyros and control systems, and there are selectable 10ms, 20ms of the signal repetition time. The Real-Time Telemetry is perhaps the feature I need to focus on, since it is not only comprehensive, and voice delivered, it is accurate and immediate, so you can make split micro-second decisions. All the flight telemetry (black box) data is stored in the SD card, so you can review every flight for learning and experience analysis. There are three channel Servo Sequencers; this means you can preset actions including the retraction of landing gears and opening/closing of gear doors. This is done with an automated toggle logic switch, or if you want more control, with a full switch. To be honest, this is an expensive professional model for the serious user, the para-military user, and the full-time RC model competitor. It really doesn’t get better than this, and with the expertise and excellence of a German precision engineered device, you get full and total control over your environment that is highly secured and extremely accurate.